My heart’s on fire tonight, what do we do now? We gotta settle our bet, how could you forget? How come we don’t love like that no more..
Well how come, how come? How come we don’t love, love like that no more.. I would give you anything, where did you go? Did you tell her a secret that you disguised? But I took the time for you, can’t you see? I wanted to let you see the real me? 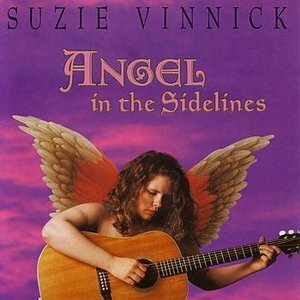 Angel in the Sidelines is an eclectic sampler of Suzie Vinnick’s masterful musicianship, fine writing, exceptional range of talent, and exquisite singing. The bookend songs on her first Eizusagous Rox Records release stirringly take you into soulful heartache, through questioning struggle, to holding on with faithful hope. That Vision opens with a stadium-filling arrangement that rocks with tasteful twists of vocals, violin, guitar, and organ, and on Ron Sures album-ending Carry On she stunningly and deeply warms you with a ballad of encouragement and peacefulness during moments of great sadness. For longtime fans, Oreo Cookie Blues and How Come showcase Suzie’s singing, bass playing and the searing guitar of Tony D.(the stellar bluesman of ‘Tony D. and his cool band’). Rick Fines joins Tony D. on these two cuts and adds his acoustic, electric, and slide guitar touch on number of the CD’s songs. Jackson Delta bandmate Al Black twirls a pitchful harmonica around Rick’s dobro and Suzie’s bass, guitar, and vocals on Suzie’s late night lament Calling the World. (Suzie and Rick recently finished up a 25 city 28 day tour on the heels of Rick’s recently-released first solo album, Arcadia. Suzie’s ethereal voice really hits home on her When You Lose In Love, evincing pangs of suffering from the self-titled subject. On Angel From the Sidelines, Suzie serenely hits home on the heartwrench of letting go. Terry Tufts lends touching harmony on Suzie’s Angel From the Sidelines and blends nicely with Suzie and Rick on Roy Forbes tender Do I Love You. Ron Sures exhibits a nice combination of writing, playing, and producing; wrapping soft and complementing instrumentation around Suzie’s singing and incredibly-strong finishes. For the country-blues-rocking minded, When You Look Back and What Will We Do Now will have you shaking a tailfeather on the dance floor. There’s no shortage of rhythm on the album; with Gary Craig and Peter Kiesewalter providing the drums and organ underpinnings to Suzie’s powerful vocals throughout. Suzie ventures into a Bourbon Street-like I Don’t Wanna Know (What Time it Is), a Rick Fines collaboration, with tuba and clarinet to boot! As you’ll hear, whatever your primary taste in music; folk, ballad, rock, country, blues, country-blues, and mixtures thereof, you’ll find your thirst satisfied the first listening through, and then further grow in appreciation as you branch into the full range of performance that Suzie Vinnick presents. I look forward to enjoying future productions that feature Suzie’s soul-grasping renditions.